Back in ’99, I initially dabbled in collecting and trading the old Movie Maniacs figures while in college. After graduation, I experienced a hiatus in collecting but still kept an eye on what was coming down the pipe in the movie action figure realm and noticed NECA was quickly taking center stage. Around 2007/2008, I really wanted to get into collecting again but I was kind of beyond the point of wanting to buy figures to just keep them in the package. Instead, I wanted to display these great pieces off their cards, but I just couldn’t figure out a way to do it that would match my style. Flash-forward to the end of 2009, and on a whim I bought my first NECA figure, the T2 T-800 Cyberdyne Showdown and promptly displayed it on the top of my Belgian wet bar. I think the initial spark of my NECA collection also coincided with the fact that I was deeply involved in a tough graduate degree program and buying and displaying figures was a means of relief and/or therapy from the stress of school. The Terminator 2: Judgment Day T-800 Cyberdyne Showdown figure. My collection really started to explode when my international confidential secretary suggested that if I was going to place figures on the bar, I needed to find a way to light them up so guests could actually see them in the evening time. So I found a great little company on the web that sells miniature spotlights. Once I realized how much proper lighting greatly highlighted the superb qualities of NECA figures, I started expanding my collection beyond the Terminator, Predator, and Alien franchises and searched out some of your earlier works like the Hellraiser and Cult Classics lines. I now have individual lights for nearly every figure on my bar and I regularly change out the figures and lights depending on my mood for a given period. The combination of specialty lighting and NECA figures has also propelled me into collectible figure photography and I hope you’ve enjoyed some of the works I’ve shared on your facebook account. The upcoming Aliens Hicks figure plus the unidentified Colonial Marine. I’d be remiss if I also didn’t say the updated Predator (P1) with new leg articulation. 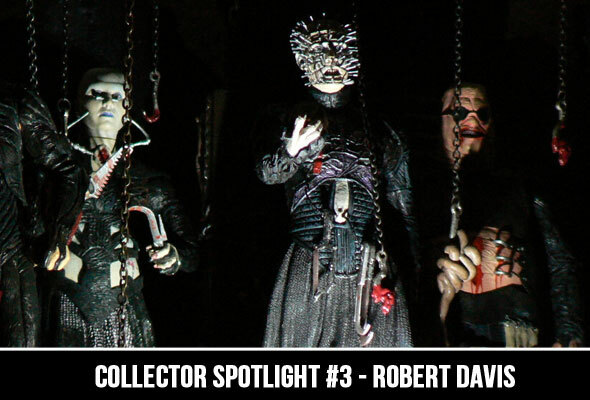 You can see all of our previous collector spotlight features and then submit your own! We’ll share 1 or 2 of these every month right here, on FB, on G+, and on Twitter.